The Dempsey-MacCready one hour competition. This prize is for the first person to travel more than 90 kilometers in one hour from a standing start on their bicycle. The teams entered are the Varna team ridden by Sam Whittingham (Canada), Matt Weavers Cutting Edge (USA), Lars Teutenberg Team Vector (Germany),Damjan Zabovik Team Eivie (Slovenia), Fred Markham team Easy Racer (USA), Rob English (UK) riding for Team Varna II owned by Dave Balfour (USA) That's me! and Rob Hitchcock Kyle Edge (USA). Whittingham has had the record at 52.33 mph for the past two years. The Venue for this event is the Nissan test facility in Casa Grande, Arizona. I heard today that Sam and Lars are going to be no shows. Bummer. The Drive to Casa Grande. 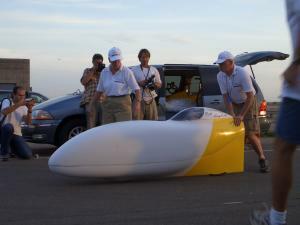 The team meets and sets up the Varna II. Late in the day Damjan arrives. Friday we race. "New British Record". Saturday we build a cooling system and look at a blown tire.